Active Directory connector. It will run but nothing happened after that. The Kerberos client received a KRB_AP_ERR_MODIFIED error from the server SCSMService. The target name used was MSOMSdkSvc/scsm12.syscenter.local. This indicates that the target server failed to decrypt the ticket provided by the client. This can occur when the target server principal name (SPN) is registered on an account other than the account the target service is using. Please ensure that the target SPN is registered on, and only registered on, the account used by the server. This error can also happen when the target service is using a different password for the target service account than what the Kerberos Key Distribution Center (KDC) has for the target service account. Please ensure that the service on the server and the KDC are both updated to use the current password. If the server name is not fully qualified, and the target domain (SYSCENTER.LOCAL) is different from the client domain (SYSCENTER.LOCAL), check if there are identically named server accounts in these two domains, or use the fully-qualified name to identify the server. Which SPN records used by SCSM 2012? 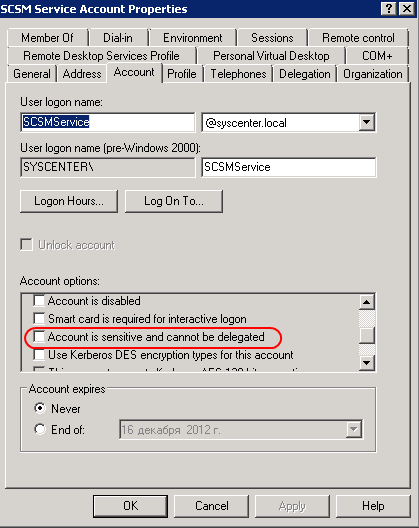 The SCSM 2012 use the SPN with he service class “MSOMSdkSvc”. SPN must be registered to service account (or run as account for System Center Data Access Service). There is a two options can exist. First if your service account is Local System (this is extremely bad idea). In this case the SPN record must be registered to account of the SCSM server(s). This account named as server name with $ sign at the end (SERVER$). When I should configure the SPN records for SCSM 2012? In my case the SCSM is a server and my SDK service running under SCSMService domain account. So even if you grant permissions for service account to modify the SPN records the wrong SPN records will be created. where SCSMSERVER$ is a server account of your management server. First command must be repeated for all of your management servers (and DW too). To check the result of the each command see in table below. I have a two SCSM servers named SCSM12 and SCSM. Both of them use SCSMService account as service account. You must repeat this commands for each of your management servers (DW too). Also you must restart SDK Service to take effect. Appendix. Active Directory configuration for Kerberos delegation. The second of main concepts of the Kerberos protocol is a delegation. Kerberos Delegation is a feature that allows an application to reuse the end-user credentials to access recourses hosted on a different server. SCSM use the delegation so it must be properly configured. For service account must not be turn on option “Account is sensitive and cannot be delegated”. 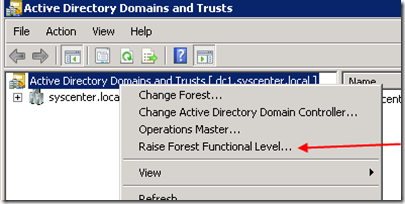 To check the service account option find your account in “Active Directory Users and Computers” snapin and open Properties. On Account tab find the “Account is sensitive and cannot be delegated” and check what it NOT enabled. Next post: SLA in SCSM 2012. Part 1. Object model. How about when you also use SCOM 2012? Any thought on how the SPNs should be setup for a hardware load balanced environment? Here is excellent article from Marcel regarding NLB configuration. SPN too. I need to rename my SCSM 2012 server. I tried that but then the service does not start anymore. Could this be related to the need of creation new SPNs or is there something more necessary? As far as I know there is no supported way to rename SCSM server in-place. Do you have any recommendations regarding the portal itself? should I configure the SPN records for it too? I have the well-known “blank page” issue on the portal (for the web parts) only for users that are not using VPN (the portal is on 444 and content server on 443, on the same server, using a single cert). I can telnet both ports without connecting to the VPN, although if I try accessing the Settings.xml page it’s not working. But if you connect to the VPN access the same page, and then disconnect, the web parts work fine. Also, without connecting to the VPN, if I try the Settings.xml page from Chrome, it challenges me for user and password, and then it accesses the page, so it’s only happening with IE, so it has to be something related to authentication. I’ve checked everything (web.config is fine, the url on the app settings is fine, cert is fine), I’m out of ideas… If you have any or think this may be related to the SPN records, please let me know! Hello. Great Article. Although I have a quick question to help clarify a few things for myself. I have SCOM 2012, and am building SCSM 2012. The system center data access service for both products runs with its own domain service account. However, the SPN for MSOMHSvc/* currently all point to the SCOM server name. If I understand correctly, I should delete the MSOMHSvc SPNs that point to the server name and create new SPNs for SCSM and SCOM service accounts?